If there is one thing that I am very proud of, it would be how good and dedicated I am with my body care routine. I shower with a loofah for mild exfoliation and moisturize my skin either with body lotion, cream, butter or oil every day and use either a physical or acid exfoliator once a week. That doesn't mean I have never made a skincare faux pas before though...I used to sunbathe without sunscreen and I would happily bake myself under the sun from 2-4pm. Yes, I cringe when I remember those not-so-smart days. No thanks to my foolishness, I do have some freckles on my body. 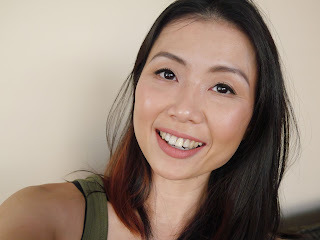 They are not getting any worse as this mama is now sun-smart but I've always wondered, why are there thousands of facial brightening products on the market but we're hard pressed to find one for the body? 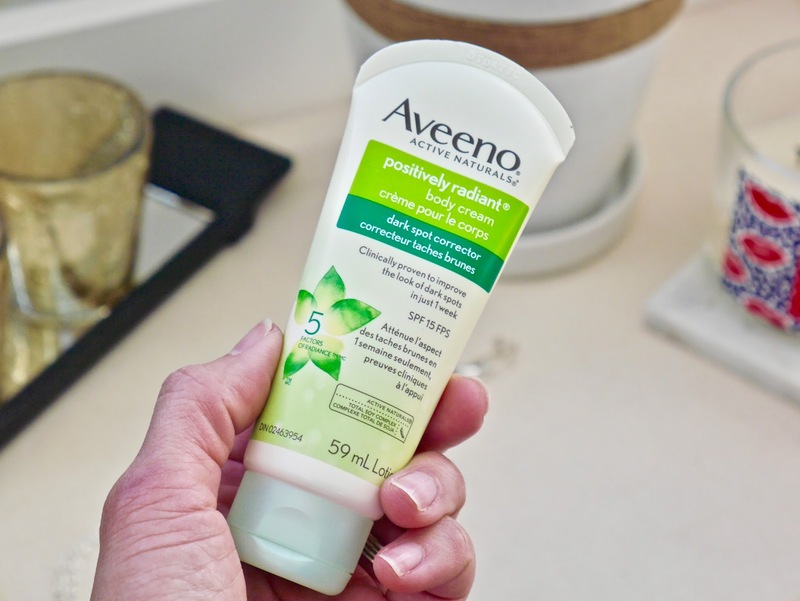 Aveeno recently expanded one of their best selling skincare ranges, Positively Radiant and it includes body care products. I was very kindly sent three products; Positively Radiant Exfoliating Body Wash*, Positively Radiant Body Lotion* and finally, Positively Radiant Dark Spot Corrector Body Cream*. Aveeno Positively Radiant range is formulated with ACTIVE NATURALS® Total Soy Complex which helps to tone, hydrate and brighten the skin. Soy is rich in Vitamin E, fatty acids and lecithin which has amazing moisturizing properties. Just how popular and highly regarded is soy? Well, back in Malaysia if you are an expectant mother then almost everyone will advise you to drink soy milk and eat tofu fa, a well know soy dessert so you will have a fair skinned baby. And before some of you get all up in arms about racism and such, please understand that in many Asian cultures, having fair skin equals beauty and superiority. My point is, soy's brightening properties has been acknowledged for centuries. 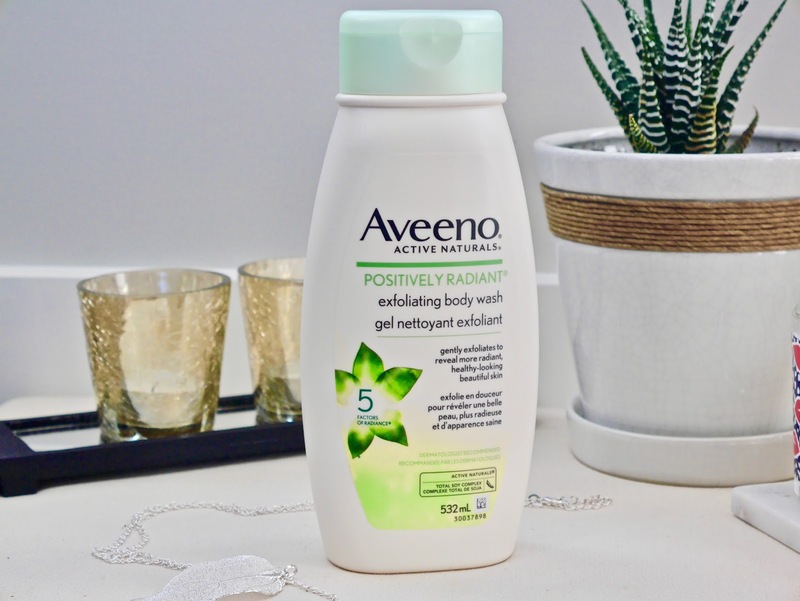 Aveeno Positively Radiant Exfoliating Body Wash* is such a pleasure to use. The texture initially surprised me as it squeezed out really thick but it melts into the loofah like butter and creates a lot of foam so a little goes a long way. It has Sodium Laureth Sulfate (SLES) a gentler surfactant but if you are sensitive or avoid that ingredient then this is not for you. This body contains Citric Acid as chemical and Walnut Shell Powder (this replaced micro-beads in the old formula) for physical exfoliating properties. Citric Acid is an AHA derived from citrus fruits but because it has a bigger molecule than Glycolic Acid, it's not as effective as the latter. That doesn't mean it's ineffective, it still exfoliates but in a much gentler manner. I honestly enjoy this body wash and I love that I can use it once every couple of days for a gentle exfoliation. It leaves my skin feeling extremely soft and smooth and yet hydrated. The scent is also gentle and not overpowering which makes it perfect for both Mr. Platt and me. Aveeno Positively Radiant Body Lotion* has a thicker texture than most body lotions that I have tried. It does have a soft scent to it but it seems to disappear as soon as I massage it into my skin. Don't let the thick texture fool you into thinking it will feel heavy and leave residue on the skin because it absorbs almost instantly. Initially I was worried that I wasn't using enough but I only need one pump for each arms and legs. Aveeno promises 24 hours hydration and they are not kidding. I only need to moisturize my body once and 24 hours later, my skin still looks hydrated! Yes, for the sake of testing I didn't shower for 24 hours, what can I say, I am dedicated. Usually my elbows, knees and shins will start looking dry and a touch scaly after 15 hours or so but that never happened when I used this. If you dislike body lotions because most feel heavy and greasy then I highly recommend giving this a try. I haven't seen any brightening effects but I love how hydrated my skin is with it. Repurchase? 110% yes if I ever finish my stash of body lotions. Aveeno Positively Radiant Dark Spot Corrector Body Cream SPF15* is meant for neck and chest. Just like the body lotion, it's very hydrating and the added SPF is a huge bonus. The texture is light and absorbs almost instantly without leaving any residue. I think this is a great product for anyone who has freckles around his/her chest area as it's meant to brighten and erase dark spots while protecting it from the sun. Thankfully I don't have that problem (yet!) so this is not a product that I need in my routine. I apply normal sunscreen down my neck and chest area every time I leave the house so I will not be repurchasing when I finish this tube. 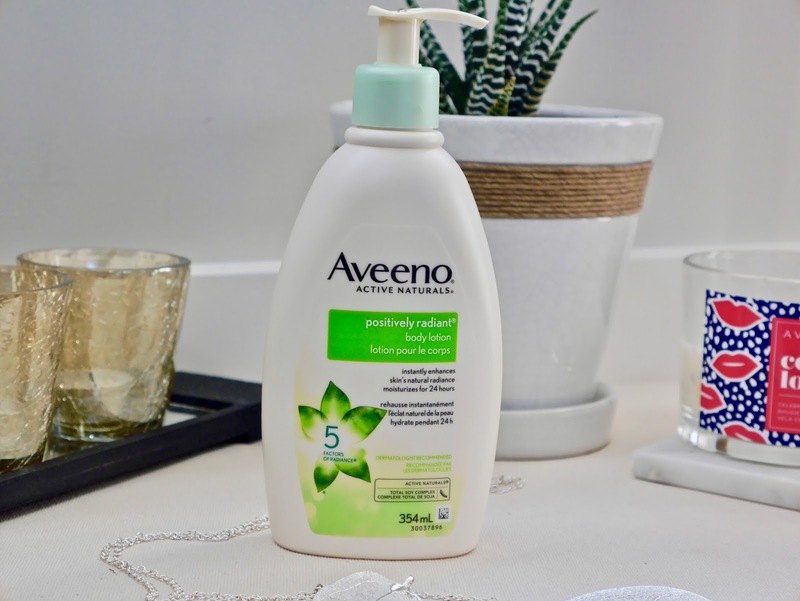 Overall I am happy to have these products in my routine and it's good to see Aveeno expanding their Positively Radiant range. 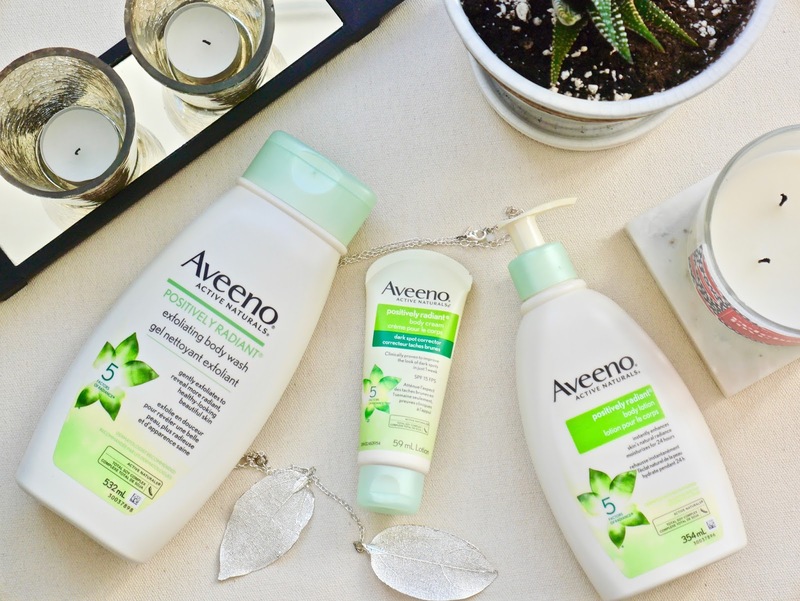 Are you a fan of Aveeno? *I received these products for free through BrandBacker.com but my thoughts and opinions are 100% unbiased, honest and my own. There is no place for any sort of BS here.